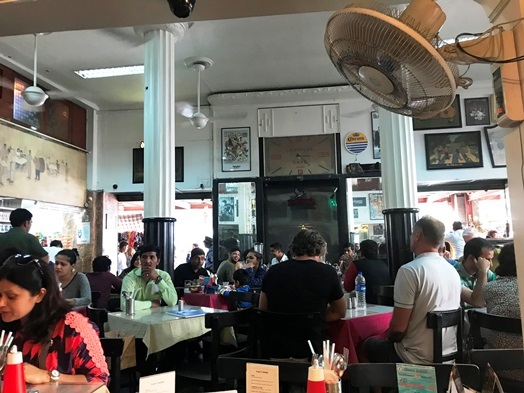 The Leopold Café is a ‘traditional’ café. Well, to be more precise, it is a place which was the location of a terrorist attack a couple of years back and is, therefore, apparently, quite famous. 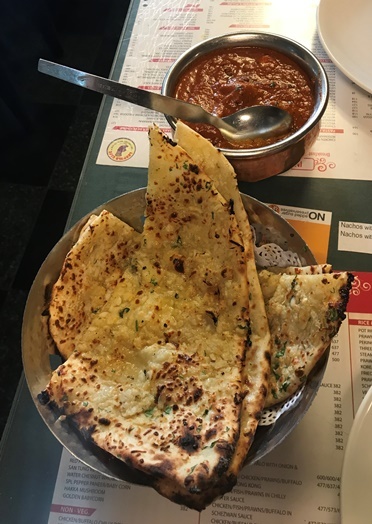 So, well, given I was only for 40 hours in India, I decided to pay it a visit and to get some real traditional Indian food you’d eat with your hands. And the “paneer tikka” (382 INR) served with “garlic naan with cheese” (127 INR) was a lovely combination. Admittedly, quite heavy really but super yummy! Unfortunately, they only served “Budweiser (420 INR) as a a beer and didn’t offer anything traditional. However, the beer goes well with the local dishes. When it comes to the service – I was at first annoyed and then positively surprised. The waiter who took up the order was completely not organized and I was sure he would mess up my order – but he didn’t and the food actually arrived incredibly quick. Now, to assess the place – I don’t get the fuzz about it. It’s a café, and a rather regular one. The food experience is nice but it is definitely nothing amazing as an experience.